Why the ‘Silk Road’ is a massive misnomer, in more ways than one. China was traditionally known as the “Middle Kingdom,” the place whence all roads expanded outward to reach the wider world. In contemporary times, there has been a lot of attention focused on China’s “One Belt, One Road” project, which is marketed as the modern iteration of the ancient ‘Silk Road.’ It aims to establish a web of interconnectivity throughout Eurasia, by both land (the belt) and sea (the maritime road), allowing goods and commodities to be transported everywhere, supposedly, like the old Silk Road. But the name “One Belt, One Road” betrays a common misconception about the historical Silk Road, namely that it was a “road” with actual start and end points. …‘silk’ is even more misleading than ‘road,’ inasmuch silk was only one among many Silk Road trade goods. Chemicals, spices, metals, saddles and leather products, glass, and paper were also common. 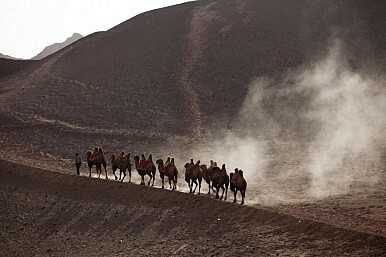 Nonetheless, despite this plurality in paths, most did converge eventually at a few large oasis hubs and nodes, like Bukhara, Samarkand, Fergana, Merv, Kashgar, and Khotan. Trade was always precarious, and wars and disruptions could easily reduce its volume. The expansion of European shipping after 1500 further led to the drying up of trade, but because of their local nature, Central Asian land routes never fully collapsed. Furthermore, due to the great distances involved, it is highly unlikely that caravans traveled along the whole length of Eurasia. Instead trade continuously passed between middlemen and exchanged hands every few hundred kilometers — about 500 kilometers at most. There is no evidence that the Roman Empire and China ever traded directly and the earlier Roman coins found in China are actually Eastern Roman (Byzantine) coins from the sixth century. In any case, the Chinese state dissociated itself with trade, and most trade was conducted in China by private initiative. The Tang Code of the Emperor Taizong (reigned 627-649) viewed commerce as polluting and did not allow officials above the fifth rank (out of nine ranks) to enter marketplaces. On the other hand, sea routes boomed during the ancient and medieval periods, and continue to do so. Like the overland routes, there has never been one maritime road, although there were more long-distance trips by sea than by land. It was not uncommon for Arab sailors to go from Basra in Iraq to Guangzhou in southern China. But like the land routes in Eurasia, there were also many local, overlapping trade routes, with terminal points in places like Ceylon and Srivijaya in Sumatra. The Indian Ocean has always been a center of commerce, as Arabs, Persians, Indians, Malays, and others used the monsoons to transport large quantities of goods swiftly from East Africa to China, overcoming the problems of time and distance. India, unlike China, has many caches of Roman coins, brought over by sea. Sea trade along the southern rim of Asia far exceeded, by hundreds of times, the volume of goods transported by land, even before the arrival of European ships and the creation of a globalized economy. Will this historical pattern manifest itself in the present day? Judging by the volume of trade in the maritime Asia-Pacific, this already seems to be the case. Oceanic trade will continue to dwarf land-based trade in Asia. The creation of land-based transportation can, and already is, boosting the economies of many Eurasian states, especially landlocked ones. But this will only be the case as long as the road follows the pattern of the traditional Silk Road and includes many branches, local routes, and hubs, so that everyone can prosper, without forgetting certain places, like Afghanistan, which does not yet have a lane along China’s new project.